Hauptwerk Virtual Pipe Organ • View topic - Anyone stocking Fatar replacement parts? Anyone stocking Fatar replacement parts? Last edited by hovudverk on Sun Sep 30, 2018 3:36 pm, edited 1 time in total. Re: Anyone stocking Fatar replacement parts? I've used these to repair the Fatar Keyboards which they sold me. 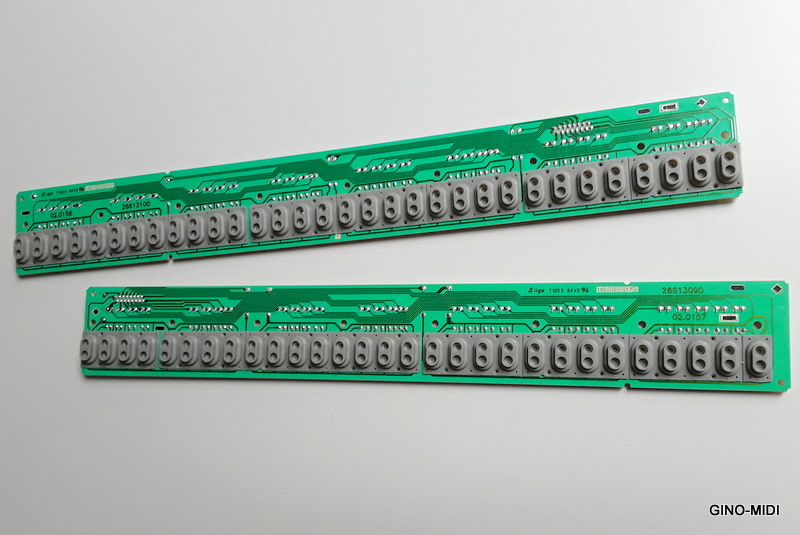 Four of the 12-contact type and One of the 13-contact type (for the highest Octave) are enough to repair one 61-note Keyboard. There are detailed instructions for using them, somewhere on their Website. If you are looking for the bubble switches with the black buttons on them for the 61TP/60LW, you may be able to purchase them through Doepfer or MIDI Works Canada. It may be easier to buy new 61TP/60 keyboards as the keyboard model in your message does not come up on the Fatar web site. If you are trying to replace the tracker touch snap bubbles, you may find it much more difficult. Also see viewtopic.php?f=15&t=17092 for bubble switch repair. Thomas: The keyboard model is TP/6LP, not 6TP/LP as I mistakenly wrote originally (corrected now). The key contact strips are fine, it's the tracker touch bubbles that are worn out and need replacing. Two independent VPO builders have told me that it's possible to order replacements, but neither has been able to do so, so I'm afraid you're right it's difficult! It's a shame really, because they only last a few years in a practice organ that gets daily use, and are simple enough to replace if you have the parts. Quite repairable stuff, but possibly only in theory. No problem: in the past I ordered them at Johannus Organs in The Netherlands. Do the contact bubbles look like this? Just the grey contact bubbles, not the pcb. engrssc wrote: Do the contact bubbles look like this? Just the grey contact bubbles, not the pcb. No these are the switch contacts. Hovudverk wants the tracker touch bubbles without contacts and slightly different shape. hovudverk wrote: Thomas: The keyboard model is TP/6LP, not 6TP/LP as I mistakenly wrote originally (corrected now). The key contact strips are fine, it's the tracker touch bubbles that are worn out and need replacing. Two independent VPO builders have told me that it's possible to order replacements, but neither has been able to do so, so I'm afraid you're right it's difficult! OK, here is what I was told when I tried to buy TT bubble strips. Fatar does not sell them as a separate item. The old strips must be returned to Fatar and when they next make a run or next buy these TT strips, they will add them to the run/order and then send the new ones to you. I believe the intent is to prevent the changing non TT-keybeds to TT-keybeds. So my understanding is nothing will happen until Fatar Italy receives the damaged strips and puts the order in the queue. No one at Fatar will speak English on the phone although we managed to have someone speak with them in German. Your best bet is going through someone who has a relationship with Fatar and speaks Italian. Jack: Here's a picture of one of the strips (if you can't see it, try this link). Is this what you managed to get from Johannus? Thomas: Your experience makes sort of sense as seen from Fatar's perspective. Thanks for sharing. It may seem that for most of us, who don't happen to have dealers fluent in Italian, a Fatar keyboard for a heavily used practice organ needs to be regarded as a consumable item, due for replacement every few years. I know an organ builder who tried several times to contact Fatar by email with absolutely no success. Finally, in desperation he sent them a letter, typed on company headed notepaper and posted in an envelope with stamps - and received a reply by return of post! Last time I spoke to him he had a stock of Fatar keyboards (but not spare parts, as far as I know). Yes, that is what I received from Johannus. For every manual 4 strips with 12 "bubbles" and one strip with 13. Total; cost was less then $ 20 per manual. Jack: That's very good to know. Many thanks for sharing your experience. I'll try contacting Johannus! It hasn't worn down - it was never there! What you see in the photo is not one of the rubber contact strips at all. It is an additional strip that Fatar fit to their keyboards in order to impart the so-called "Tracker Touch" feel (which, in my experience, bears no resemblance whatsoever to the touch of the real tracker organs that I have ever played).